What are my Library Card and PIN? Your University student card is also your library card. Always carry your DMU student card – you need it to access library and other university buildings, to borrow books and to photocopy in the library. You must produce it when requested to do so by a member of DMU staff. 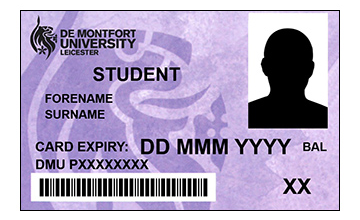 Your DMU student card is for your personal use only, and must never be used by anyone else. Your Library PIN is sent to your email when you begin your study. If you don't have your PIN, or would just prefer to have something more memorable to you, you can reset it here or you can visit a Library Information desk. 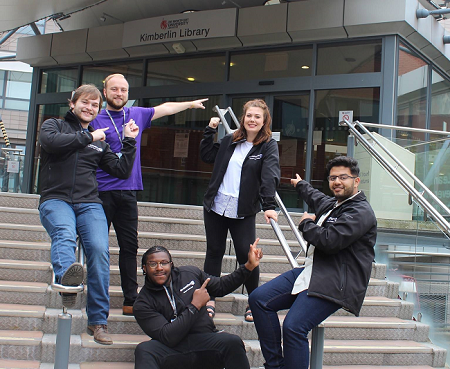 The main Kimberlin Library is open 24 hours a day, 7 days a week, 365 days of the year, so you can study whenever it suits you. You can also use the Library’s online services 24 hours a day, wherever you have Internet access. The specialist Law Library in Hugh Aston is generally open until 9 pm, and the Learning Zones in Eric Wood and the Greenhouse until 10 pm during term time. Please check here for the current opening hours of all our Library spaces. What types of study spaces are in the Library? Library and Learning Services offer a variety of study areas. For these to be effective all students are asked to abide by the regulations on each of the library floors. In these areas no talking is allowed. Silent study areas can be found in the Kimberlin Library on both the Second Floor and the Lower Ground Floor. 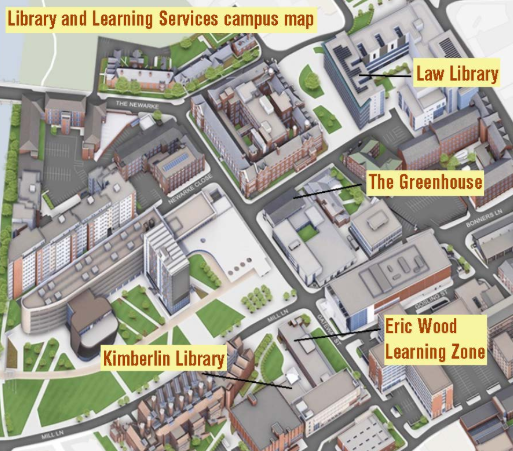 Learning Zones in Kimberlin and the Greenhouse cater for group working and we have bookable Syndicate Rooms in Kimberlin and Hugh Aston Law libraries. Quiet Study is permitted in Eric Wood and the Greenhouse Learning Zones. There are dedicated Silent Study rooms on the Second Floor of Kimberlin. How do I find books, journals and e-resourses? There are several ways to find the library materials you need including Library Search, the Library Catalogue, the e-Resources portal, databases and individual Subject Guides for your course. You can find links to all these resources in the Search & Find section of the Library website. A good starting point is Library Search which will give you all the information that you need to find books on the shelves in the Library or journal articles and e-books online. To borrow books use the self-issue machines on the Ground Floor, First Floor and Second Floor of Kimberlin Library. You will need your university student card and your Library PIN to do this. You will receive a receipt listing the date each item is due to be returned to the Library. If the book you require is out on loan to another user, you can reserve it so that once it is returned it will be held for you to come and collect. How long can I keep my book? When you take an item out, the initial loan will be for two weeks, and at the end of that period we will automatically renew it for you for a further two weeks – and continue to do so until someone else reserves the item, you finish with it and bring it back or you reach 99 renewals. You don’t need to log in or call us: it will happen automatically without you needing to ask for it. An item will not be renewed if someone else has reserved it, but you are guaranteed to have it for the full two weeks and will not be asked to bring it back any earlier. We will email you if an item cannot be renewed. This will be using your DMU email, or the email address you provided when you joined us. If you don’t hear from us, your items will have been renewed for a further two weeks. If we need a book back and can’t renew it for you, we will tell you five days before it’s due, with a reminder on the day before it is due back. Fines will be charged if a reserved item isn’t brought back by or on its due date. To return books to the Kimberlin Library, simply post items through the return slots in the foyer. You will receive a receipt listing all returned items. If the Library is closed, use the return book drop outside. To return books to the Law Library, you will need to take them to the Library counter during opening hours. Where do I find my Reading List? Most of your modules will have Resource Lists (aka reading lists) to help you to find out more about your subject. Some lists might be short, with less than five books or journal articles to read; others might be longer and split into sections. Your tutors will give you advice about what to read and when. You can find help and information about using your Lists in this Guide and you can search for your Resource Lists here. You can get onto the internet anywhere on the DMU campus, all you need to do is scan wireless networks with your phone or laptop and select Eduroam. Eduroam is a global Wi-Fi network, and allows you to log in at universities, colleges and hospitals worldwide. What are my Wi-Fi username and Password? Password: Unless you have already changed it, this will be your date of birth in the following format: dd/mm/yy e.g.16/07/98. How do I log on to the computers? Across all Library Spaces PCs and Macs are available. These computers give access to Microsoft Office, Internet access via a range of browsers and much more. We also provide designated PCs with disability software such as Zoomtext. Your Single Sign-On details will give you access to your university student email account, myDMU, Blackboard and your Library My Account, as well as DMU's computing services, including scanning, photocopying and printing. You will also need this to access e-books, e-journals and research databases through the library website. You must change your password at the earliest opportunity. Your student email address will be pnumber@my365.dmu.ac.uk. If you do choose to bring your own laptop with you to DMU, our students can access our wireless network throughout the library – you’ll just need to go to myDMU to register your own laptop. You can find more in-depth information about IT provision here. Printing is simple at DMU, just use your student card at any machine and you can print from and to any student printer at the university. How much does printing and photocopying cost? Just swipe your student ID card and touch the icon for print, copy or scan. It is your responsibility to make sure that your work is 'print ready'. If you're not sure then please ask a member of staff. If a technical error has caused your document to be produced incorrectly, we can re-credit your account, but we will need evidence of this. Make sure that you log out once you've finished so no-one else can use your account. 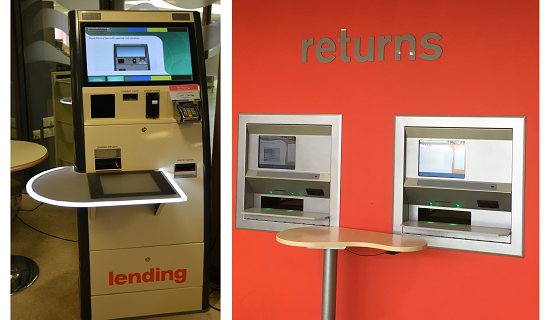 You can pay for your printing and photocopying by topping up your print account via dedicated kiosks in the Kimberlin Library foyer or online here. Where do I go for help in the Library? Library and Learning Services offer a wide range of guidance on all aspects of your studies. When you are in the Library staff are available on information points on the Ground Floor and the First Floor. Staff here will be able to answer general enquiries during staffed hours. Library staff also rove throughout the libraries. They wear library lanyards so you can identify them and ask them for any help or directions you need. Librarians have subject specialist knowledge and can help you find good quality information, search effectively and reference accurately. Librarians run drop-in sessions, pop-up libraries in faculty spaces and 1:1 tutorial sessions. They also create and manage Subject Guides to help you find the best resources for your area of study. Find out more about Librarians here. For help with IT queries, visit the ITMS Team on the First Floor Desk of the Kimberlin Library. The team offers confidential one-to-one advice and guidance to help any student with particular needs. Specialist provision includes access to Assistive Technology and extended book loans. Find out more about Library Disability Services here. There are a range of assistive technology software products available in the Library. These include mind-mapping, speech-to-text, text-to-speech, note-taking and screen magnification. There are workshops and drop-in sessions available for you to find out more about using these technologies. Visit the Assistive Technology guide to find out more. CLaSS offers all students advice and guidance for successful study. All new students are invited to participate in the Self-assessment Exercise, an anonymous evaluation of your confidence in your academic skills. Find out more by visiting the CLaSS guide. The team can help with your understanding of maths and statistics, through daily drop-in sessions and one-to-one appointments. Find out more about the Maths Learning Centre here. Where can I view all library support workshops available? You can book tutorials and find workshops here.